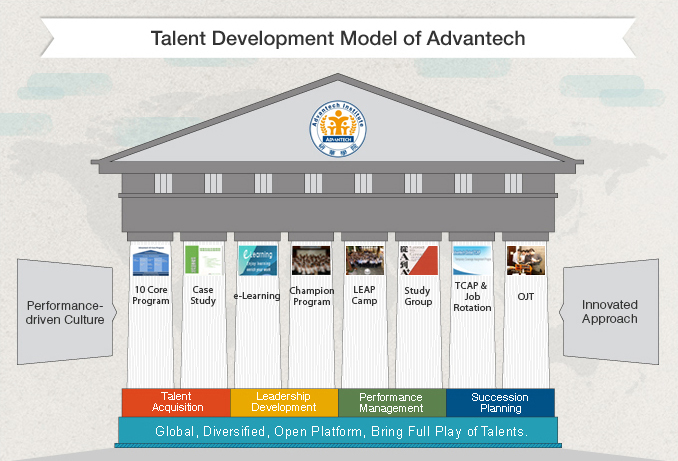 Based on experience sharing, benchmarks, and sharing and learning, we developed the Advantech talent model to grow our talent and create a lifelong learning environment through internal and external channels. “Advantech Case Study”is a written document outlining our invitation to industrial experts and professors to discuss key topics chosen by our management team about Advantech’s business development. Through discussion with executives, colleagues and experts, they initiate the future forward approach and strategy. Advantech champion program uses case studies, seminars, pre-assignments and essays to disseminate corporate core value and culture, and to help extend strategic viewpoints and increase interaction with executives. TCAP stands for Temporary Coverage Assignment Program; this is a program for talent development. TCAP involves a short-term assignment of about 3 to 6 months that covers corporate level, top-down, or emerging territory market projects. TCAP includes Taiwan HQ and Advantech worldwide offices, and it provides a growth opportunity for employees to develop and gain broader experience.